Over the last several years, Tenzin Gyatso, His Holiness the 14th Dalai Lama, has suggested that he may be the last in the venerable line of Dalai Lama reincarnations dating back to the 15th century. This possible failure to reincarnate by the Lama, who turns 80 in July, has not pleased the Chinese government. Last year, after the Dalai Lama intimated during a BBC interview that the institution of the Dalai Lama may have outlived its usefulness, the Chinese government said there definitely would be a successor to the 14th Dalai Lama. And that the next Lama will be selected by the Chinese Communist Party. Conflict between Tibet and China over the selection of Dalai Lama, the highest figurehead in Tibet since the 17th century, is not new. For the Tibetan people, the Dalai Lama is a cultural hero with ancient and imagined origins and the spiritual authority of centuries of tradition. What is unique about the Dalai Lama is that he is a political ruler selected not through heredity or popularity, but through reincarnation. Buddhists believe that all living beings are trapped in an endless cycle of birth, death, and rebirth called saṃsāra. We are thus impelled by the force of our mental, verbal, and physical actions, often referred to as karma, accumulated over infinite lifetimes. Reincarnation has to do with the cycle of sorrow and loss that occurs when inhabitants of these realms unwittingly accrue powerful psychic tendencies that lead to new births, pleasant or unpleasant, in accordance with the subtle and complex workings of their karma. The uniquely Tibetan institution of the tulku, or “reincarnated lama,” is based on the Mahāyāna concept of the bodhisattva—who are teachers thought to be virtually identical to fully enlightened buddhas, capable of using remarkable spiritual powers to guide sentient beings in a variety of situations. One such power is the ability to choose the circumstances into which they are born, based on the needs of specific suffering beings. In fact, the word tulku literally means “emanation body” and is a common term in Mahāyāna philosophy to refer to the “human” or “earthly” guise assumed by a Buddha to assist living beings. The Dalai Lama, specifically, is understood to be both the cosmic bodhisattva of compassion and, according to myth, the spiritual progenitor of the Tibetan race. He’s also believed to be the reincarnation of a fifteenth century Buddhist master of the Geluk sect of Tibetan Buddhism. The traditional method by which the Dalai Lama and other high tulkus are discovered is elaborate and cryptic. Dreams, visions, divinations, and oracles play a significant part in determining where to search for the new incarnation. Monks charged with the responsibility for finding their master’s young embodiment attempt to identify one or more candidates of a suitable age and temperament, who may well have displayed unusual signs or spiritual tendencies at an early age. The candidates are then subjected to a series of “tests”—such as identifying persons or personal possessions—that had some connection to the previous incarnation. Once a clear favorite emerges, the matter is subjected to a series of divinations (such as a form of dice divination known as “mo” or consultations with trance-mediums who channel supernatural spirits), after which a final decision is announced. Although the general procedure is the same regardless of the tulku being sought, in the case of the Dalai Lama the process is particularly rigorous, since so much rests on the outcome. 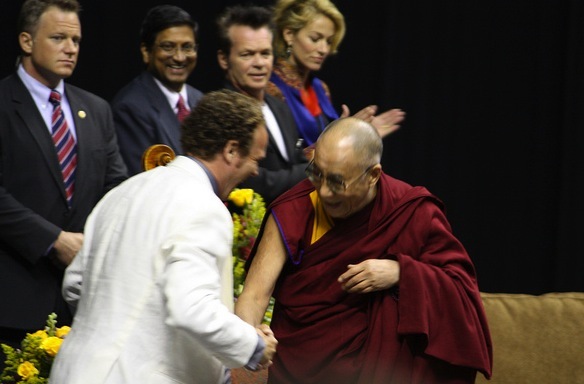 Naturally, the Dalai Lama’s prominent political role has attracted the interest of a variety of parties outside the religion. For centuries, there has been Chinese and Mongolian interference in the ostensibly “spiritual” selection process of the Dalai Lama and other tulkus. In the 16th century, for strategic reasons, the Tumed Mongol leader Altan Khan chose to support the Geluk sect in Tibet against competing religious sects, and named the monk Sonam Gyatso the first “Dalai Lama,” a term that can be loosely translated to mean “oceanic wisdom.” In return Sonam Gyatso declared Altan Khan to be the reincarnation of his famous predecessor Kublai Khan (1215-1294), thus legitimating the latter’s claim to power. After Sonam Gyatso’s death, Altan Khan’s great-grandson, Yonten Gyatso (1589-1617), was named the 4th Dalai Lama. More recently, after the present Dalai Lama fled to India in 1959, the People’s Republic of China (PRC) government began to reassert its influence in Tibetan religious affairs. In 1992, the Chinese government allowed representatives of the Kagyu sect from the Tibetan exile community in India to identify and enthrone a boy from eastern Tibet as the reincarnation of the Karmapa Lama, head of the Kagyu School and the third most important tulku in Tibetan Buddhism. Remarkably, the candidate, Orgyen Trinley Dorje (1985- ), was confirmed by both the PRC and the office of the Dalai Lama in an unprecedented accord. After living under strict Chinese government supervision at Tshuphu Monastery for seven years, the young Karmapa escaped to India. Denounced by the PRC, he now lives not far from the residence of the current Dalai Lama in Dharamsala. In fact, some speculate that the Dalai Lama may be grooming the young Karmapa (now 30) to serve as the Tibetan religious figurehead after he passes away. Another remarkable example of the increasingly blatant tendency of the PRC to manipulate the outcome of important tulku selections occurred in 1995 with the case of the Panchen Lama, the second most important figure in Tibetan Buddhism. The Dalai Lama and his associates in India, together with Chadrel Rinpoche, the then-abbot of Tashi Lhunpo, the home monastery of the Panchen Lamas, had been secretly attempting to identify the rebirth of the previous Panchen Lama, and in fact had confirmed the boy Gendun Choekyi Nyima (1989-?) as the tulku. When the Dalai Lama’s office unilaterally announced the boy to be the authentic reincarnation, the Chinese government immediately placed him and his family, as well as the abbot Chadrel Rinpoche, under house arrest and put forward its own candidate, Gyaincain Norbu (1990- ), as the genuine tulku. The PRC’s Panchen Lama was educated in China, speaks Chinese as his first language, and is a high level Communist Party official who serves on several important committees and resides primarily in Beijing, visiting Tashi Lhunpo only once or twice a year. Tibetans both in exile and in Tibet generally view Norbu with disdain, as an interloper or worse, and see the “Golden Urn” method of selection to be a corrupt contrivance historically used by the Chinese to manipulate the outcome of the search. Whether or not the “Chinese” Panchen Lama is accepted by a majority of Tibetans, his case provides a clue how the PRC may behave when the present Dalai Lama dies. The government has already demonstrated a willingness to manipulate the process of recognition and appointment in the cases of the current Karmapa and Panchen Lama, and there is no reason to believe they will not do something similar in the case of the Dalai Lama, where the stakes will be much higher. The Chinese government is playing the “long game” in its political strategy to dominate Tibet, and is willing to wait, for generations if necessary, until traditional Tibetan culture and its institutions are nothing but distant memories in order to achieve that aim. Gregory Hillis is a continuing lecturer in the Department of Religious Studies, UC Santa Barbara, where he teaches classes in Tibetan, Sanskrit, and Asian religions. He is the author of several articles on Tibetan Buddhism. Primary Editor: Alexis Hauk. Secondary Editor: Joe Mathews. *Photo courtesy of Anne Camille Jongleux.